Someone who identifies as trans is not necessarily gay. Trans people can be of any sexual orientation. Sometimes it’s helpful to think in these terms: Who you go to bed with is sexual orientation and who you go to bed as is gender identity. 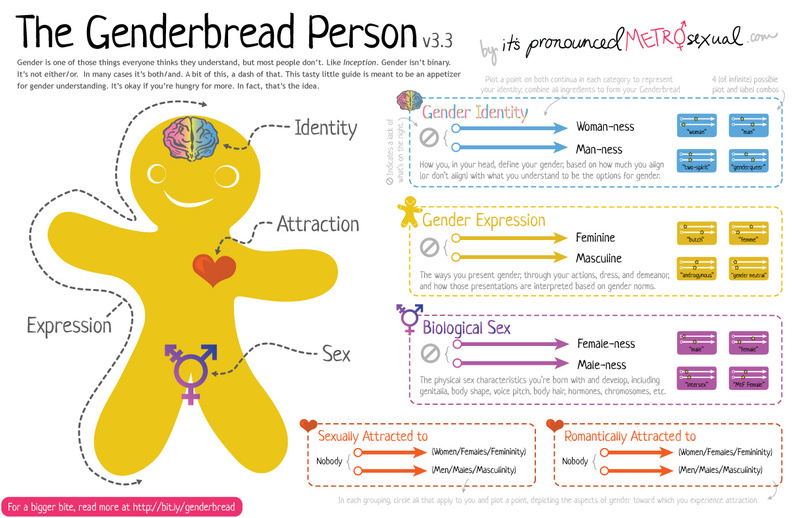 Gender and sexuality are much more complex than is generally thought. Transgender people often go through three types of transitions: social, legal and medical. The social transition involves coming out to family, friends and co-workers. It involves a great deal of planning for emotional reactions from others and stress about how one’s family, friends and co-workers will react. The social transition also involves changing pronouns and often names. It also involves non-permanent body changes – things like make-up, hair and clothing. The legal transition involves navigating various systems to change one’s gender marker and/or name (on driver’s licence, birth certificate, passport, social insurance card, etc.). Unfortunately for many transgender people, this transition also involves finding a new place of employment that is welcoming, supportive and inclusive – one that has protections for transgender people. The medical transition can involve many stages and is unique to each person. Some transgender people choose not to medically transition for many reasons. The costs associated with medical transition may be one reason. Other transfolk may not feel the need to change their bodies to match their gender identity. For those who are seeking medical transition, how the process looks often depends on the person’s age. With permission from a parent or legal guardian, gender non-conforming children can be prescribed puberty suppressants by a physician. Puberty suppressants stop their bodies from producing the incorrect hormones and afford more time to explore one’s gender. A person can begin Hormone Replacement Therapy at age 16 with consent from a parent or legal guardian. Without this consent, hormone replacement therapy can begin at age 18 once an individual is a legal adult. Most often, youth cannot get approval for gender affirming surgery until age 18. These surgeries are rarely covered by medical insurance. For children in grades K-5 and their parents/guardians, contact Gaela Mintz: gaela.mintz@tdsb.on.ca or 647-215-5918. GIG 2 (grades 6 to 9), please contact TDSB social worker Ilana David at 416-898-0895 or ilana.david@tdsb.on.ca.